Mr. John David Clark, of Andalusia, passed away Sunday, March 31, 2019, at Andalusia Manor. He was 85. Funeral services will be held 10:30 A.M. Wednesday, April 3, 2019, at Keahey Funeral Home Chapel in Andalusia. Donald A. Clark will officiate. The family will receive friends from 6:00 P.M. to 8:00 P.M. Tuesday, April 2, 2019, at Keahey Funeral Home Chapel in Andalusia. Interment will follow in Oak Grove Baptist Church Cemetery with Keahey Funeral Home of Andalusia directing. Mr. Clark is survived by his children, John Glenn (Janie) Clark, of Red Level, Diane Clark, of Washington State, and Hiedi Banner of Washington State; three grandchildren, Jamie Clark, Joseph Clark, and Missy Clark; one sister, Mable (Henry) Caton of Andalusia; along with a host of nieces and nephews. He is preceded in death by his wife, Kathleen Clark; daughter, Susie Clark; sister, Willie Mae Clark; and two brothers, Bobby Joe Clark, and Dalton Clark. Mr. Clark was a member of Oak Grove Baptist Church. He retired from the State of Alabama after working for numerous years for the City of Andalusia. 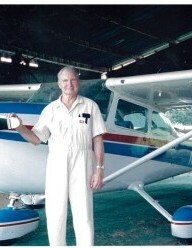 Please join us in remembering Mr. Clark by visiting his memorial page at www.keaheyfuneralhome.com. We invite you to share your memories and words of comfort with her loved ones there.